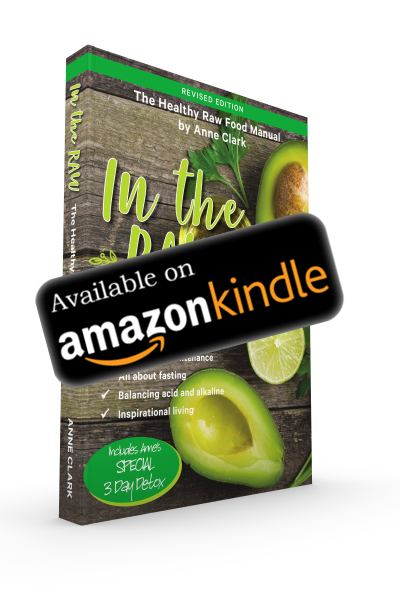 When Anne Clark began to write edition one of ‘In The Raw’ it was 1992, not long after staying at John Fielders Natural health Farm at Clohesy River, North Queensland Australia. John Fielder was a practising Chiropractor at the time and ran a very back to nature establishment in the tableland district. Anne was inspired by John’s teachings and incredible insights into natural hygiene and decided to explore creating recipes that were duplicatable and easy enough for even the most useless cook to bring to fruition. There’s the point right there, you don’t have to cook! You don’t need an oven or a fancy food processor, just the desire and passion to explore live food. In The Raw (the first ‘Australian Raw Food Manual’) was launched on a balmy night in March 1993 at Kewarra Beach resort, North Queensland, Cairns. Over 140 people came to the launch to hear Anne speak about the concept of live food along with gentle guitar playing in the background. That night guests were treated to raw cakes, treats, dips, salads, fresh carrot and apple juices. It was the most memorable night and proved to be a launch of not only the book, but of a movement in North Queensland of education and inspiration around natural living. This was before Anne’s son was born, before the real digital explosion, before Facebook, before social media, before the ‘Raw Food Movement really took hold’! This lifestyle ‘considered off the wall at the time,’ is embraced now by clear thinkers and health seekers who know that the world needs change. Now 25 years later, being the 4Th edition of In The Raw, that change is eminent. Some very influential people, Gandhi included, have said that; “If we want the world to change, we must first change ourselves.” So, if we are prepared to change ourselves, the possibilities are endless! Never has there been a more relevant time to embrace more ‘plant-based’ nutrition, more awareness around breathing, moving, sleeping, sprouting, fasting, growing food and preparing food. Doing this in a way that doesn’t cause harm to animals or humans. Never has there been a more appropriate time in history than right now to embrace this way of living. 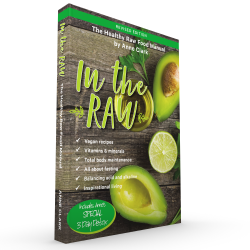 Anne Clark’s 4th edition of IN THE RAW is ‘new and improved’ ! This book is on the mark for giving you insights into raw food living. 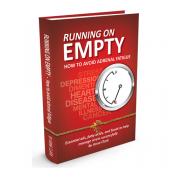 Jam-packed with wisdom on maintaining a positive mental attitude, supporting greater resistance to disease and encouraging natural healing of the human body. There’s a detailed section on Vitamins and Minerals, skin brushing, sunbathing, fasting, posture, alignment and caring for teeth. Following on from these important subjects is the chapter on Digestion and how to make it easier. Anne writes, ‘If we understand enough about digestion to realize what happens to our food once we have finished chewing and enjoying various tastes, then this will help us to further respect just what we do put in our mouths, and particularly the way we combine one food with another’. Anne has made it easier to understand the difference between Acid and Alkaline foods so the reader can make better decisions around their food choices. There’s is a delicious collection of new recipes suitable for children and the whole family, featuring doTERRA essential oils which are CPTG (Certified Pure Therapeutic Grade) useful for food preparation, cooking and enhancing our environment. Anne has been using essential oils for over 30 years, and finally found a brand that delivers both on quality and safe enough to use in raw desserts, beverages, and salad dressings, enhancing flavor and taste! 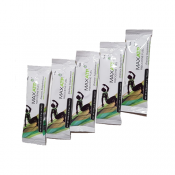 People always ask, ‘when is the best time to start a new and fresh lifestyle?’ The answer is of course ‘Now!’ There’s never a better time to start if you aspire to live a healthy and conscious life. After reading this book you will find yourself increasing water content foods, you may even take time to walk a little more each day. The message is even more relevant today as it was when Anne wrote the first edition. Decide today that you will treat your body with the respect it deserves, and amazing rewards will flow through every other part of your life. 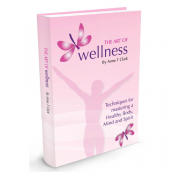 When I purchased Anne Clark’s book on Raw Foods, I couldn’t wait to try the recipes. I was so impressed with it because I could get the ingredients without too much hassle and because everything I made worked! Loved the Apple crumble and Veggie Pate. Well done Anne. Yvonne Brown. Clifton Beach - North Queensland. I made the mistake of lending my copy of IN THE RAW to a friend, and never got it back, so I ordered a few more copies, so I could give this book as a gift and not worry if it came back or not. Thank you, Annie, for such a wonderful and practical book. I use it all the time. My favorite recipe is the Carob Balls… so nice. Thank you.